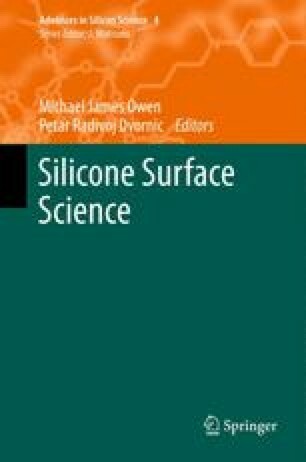 Some key surface-related applications of silicone polymeric materials are reviewed with an emphasis on polydimethylsiloxane (PDMS), the predominant commercial polymer. The applications considered are elastomers/sealants, personal care products, antifoams, silicone surfactants, pressure-sensitive adhesive release coatings, high voltage insulation, and water-repellent coatings, which together account for well over half of all silicone usage. Our aim is relate the practical usage of these products to the fundamental characteristics of the parent polymer thus extending the silicone structure/property relationship which underlies much of this book into the applications area. The key fundamental characteristic is, expectedly, the low intermolecular forces acting between methyl groups that are manifested by the low surface energy exhibited by PDMS. Compact size of the methyl group and high siloxane backbone flexibility are also of great importance as is high siloxane bond energy. No application is solely dependent on any one of these fundamental characteristics; it is their combination that dictates success in any particular application.